Its been a week since Hubby presented me with a DSLR camera for valentine’s day and it would be an understatement if I say that I had been obsessed with the new toy. I’m still getting used to it and had been practicing like crazy but unfortunately my laptop died on me. This is what I say is perfect timing. 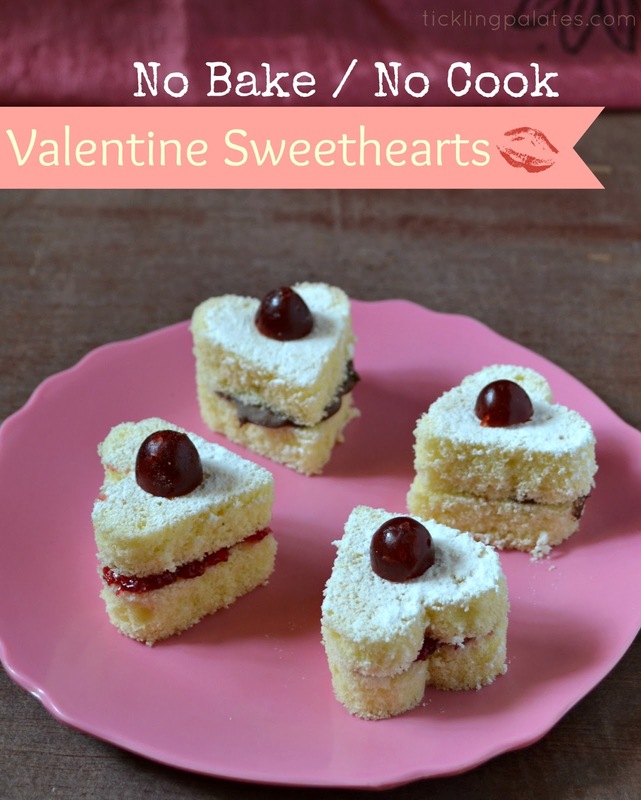 It is going to take another 2 or 3 days for me to get my laptop back and I had no plans of blogging until Hubby stepped in and lent me his laptop despite being very busy and you know why because he loved this sweethearts that I made for him. Don’t they say the way to man’s heart is thru his tummy and at least it proved to be correct in my case. A few years back both of us got an opportunity to attend a launch party of a travel agency who specialize in overseas travel packages and though I do not like to attend parties or weddings I had no other option but to go as the person happened to be our very good friend. But despite my fear about a flashy, over crowded party it turned out to be well organized and I actually loved the ambiance of the whole thing. They served some lovely hors d’oeuvres and I got the idea for this recipe when I wanted to go for an easy recipe for the Valentine Day. 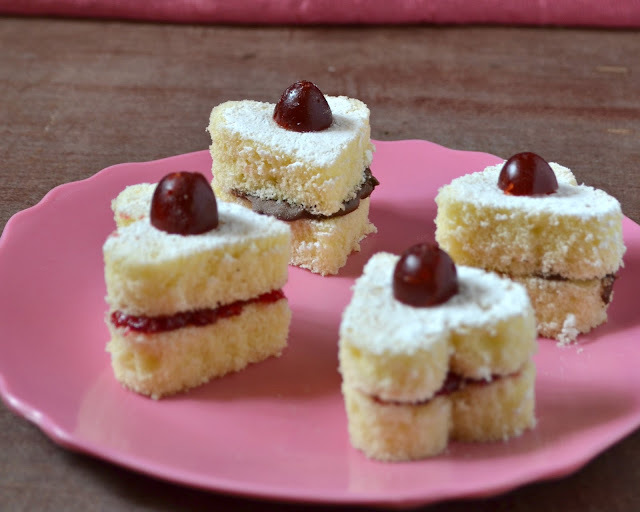 Actually this is not even a recipe but just to give you all an idea if you do not want to go in for or have the time for elaborate preparations.This will also be a fun project for kids to take to school. 1. 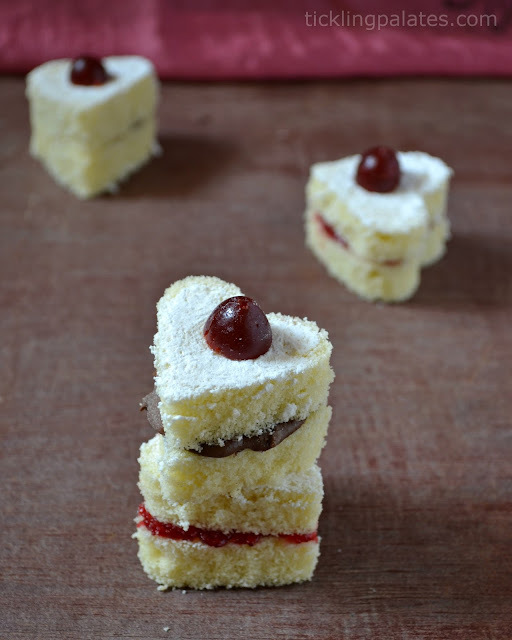 Slice the vanilla cake into 1 or 2 inch thick pieces. 2. With a heart shaped cookie cutter cut out the cake. 3. 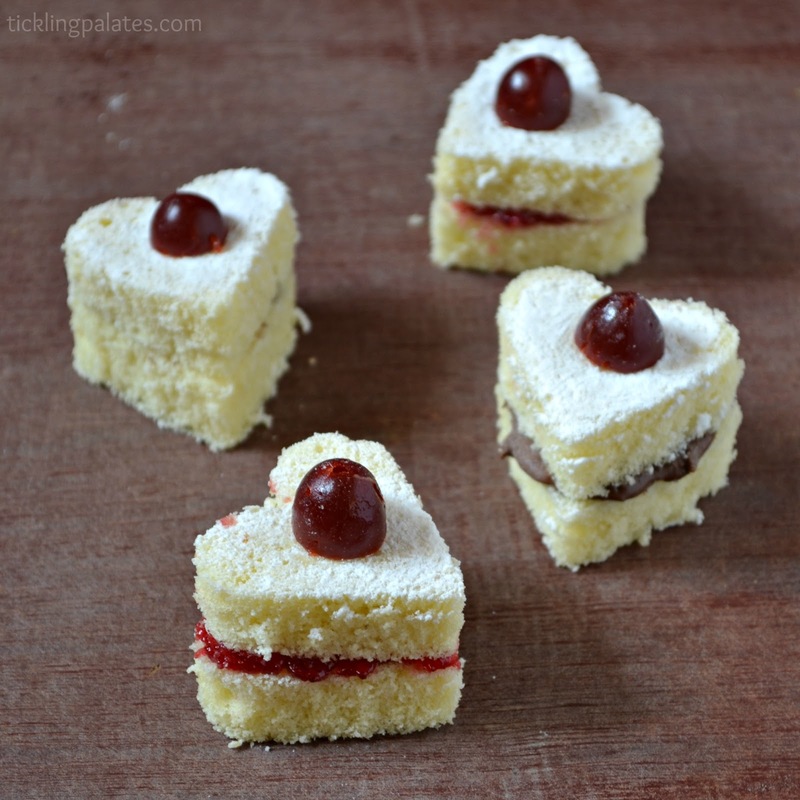 Sandwich strawberry jam and nutella between 2 heart shaped cake piece and arrange on a plate. 4. Dust the top with icing sugar. 5. Place a halved cherry on top and insert with a toothpick and serve. 1. Instead of vanilla cake you can use a chocolate sponge cake and sandwich either butter cream frosting or whipped cream. 2. You can use an Orange Cake and sandwich orange marmalade in between. Radhi, wow this looks perfect..love the pictures..so very tempting. I have a a chocolate cake in the oven Radhika.Will make these for hubby. Awesome hearts for Valentines day…. Love the clicks. Enjoy ur new toy! awesome…congratulations on ur new cam…..
Good idea..will make for some kids parties..
congrats on your DSLR gift/purchase. have fun – these cuties have my attention;like you say perfect party starters and a sure kid pleaser . this is simply superb Radhika!Happy V day.congrats on the SLR. wow that is a nice idea…. looks so picture perfect and so delicious!!! lovely heart shaped goodies. do visit my space too. Hi Radhika! You hubby must have loved your sweethearts very much! Happy V-Day! Very interesting idea, looks delicious too! Lovely pics!